First, we need to create a new Xcode project - directly for macOS. So choose Cocoa App and give a product name for the app. I prefer not to use Storyboards, so in this tutorial we will use the xib window manager. After creating a new project, let's go to the automatically created MainMenu.xib file. Since we don’t need a main menu bar, let’s delete it. What we need is a Window object (NSWindow) which is also automatically created. let deviceSupport = "/Library/Developer/Xcode/iOS DeviceSupport"
let backup = "/Library/Application Support/MobileSync/Backup"
This action is called when the button is pressed. If the button sender state is selected - a path is added to the previously declared array (var selectedPaths: [URL] = ). Before we use this array though, we need to prepare the action for deleting files first. This is very easy, but of course we should also remember, that the user should be informed, if deleting actions for some reasons didn’t work. So at last we should create a NSAlert or a label with information for the instances when removing Xcode cache didn’t succeed. Either way, our project is done. We can now build it for testing or archive it a new macOS app. Thanks for reading this tutorial. 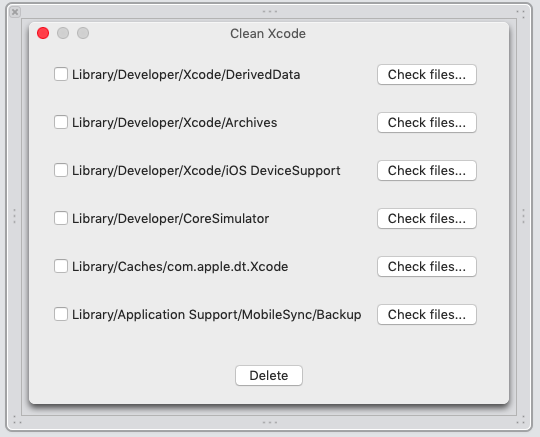 You can find the whole code of the Xcode Cleaner in our repository. Please, like us, if this tutorial was helpful, if you have questions - feel free to comment! If you are searching for a skilled, agile team to provide a web/mobile solution for your business, don't hesitate to get in touch with us. This is how we roll. Meet our Playbook!